The High brown fritillary (Argynnis adippe Denis & Schiffermuller, 1775) belongs to the well known order of the Lepidoptera and to the family of the Nymphalidae. In this great family are usually included more than 6.000 species of butterflies scattered all over the world, and consequently it is considered as the most consistent among those grouping the diurnal lepidopterans. It is difficult to recognize this species if observing only the drawing on the upper face of the wings. The strong resemblance to Argynnis niobe and Argynnis aglaja render it, in fact, indistinguishable at first glance. 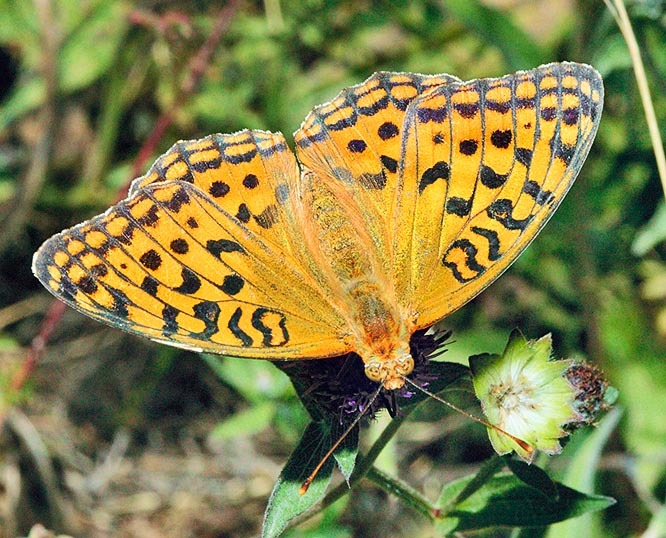 It is much similar to the niobe fritillary except for the lower face of the rear wing usually missing of the green colour near the base and for the larger silvery spots. Furthermore, also for the series of post-discal spots bordered of black whilst in the niobe the border is red. Finally, it distinguishes from the dark green fritillary as this one lacks of these spots in the post-discal area. Argynnis was a wonderful woman loved by Agamemnon who, to remember her, after her death, built a temple in her honour. This place became then a destination for pilgrims who were going there for worshipping Aphrodite (Venus). 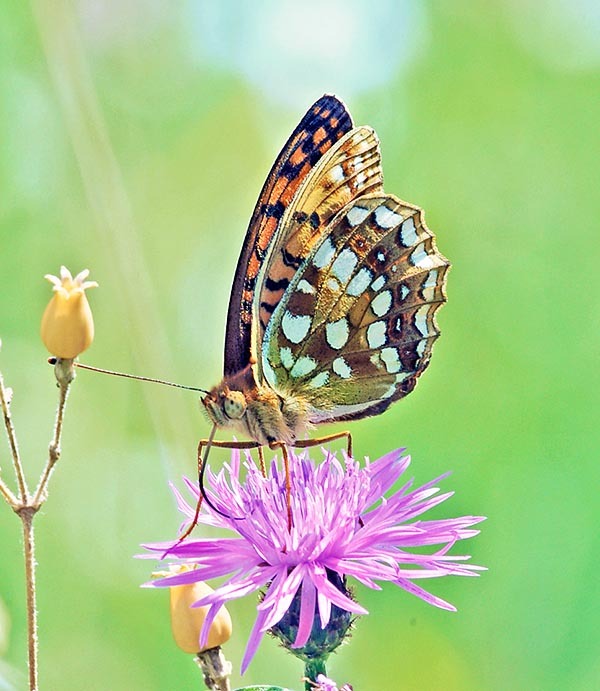 So, that was how the name of Argynnis was related to the goddess of beauty. Adippe seems to be a name invented to remember Cydippe. In fact, Linnaeus initially did call this butterfly Papilio cydippe in honour to Fabricius, the Dutch entomologist who was his favourite pupil, as the name of Cydippe did recall one Nereid, the goddesses of the sea. However he realized that this name had been already used for another species and therefore n 1767, Linnaeus wrote “that he had used adippe but it has been erroneously read as cydippe”. The dilemma lasted up to 1958 when the I.C.Z.N. abolished the name of the species cydippe establishing definitely adippe as official name of the species with fatherhood to the authors Denis & Schiffermuller. The vulgar European names are somewhat different but also in this instance, all give an indication of elegance to this nice butterfly: in English, High Brown Fritillary, in French, Moyen nacré, in German, Feurige Perlmutter- falter, in Dutch, Bosrandparelmoervlinder, in Catalan, Argentada de punts vermells, in Spanish, Puntos azules. It is much diffused in Europe but Ireland, Scotland and northern Scandinavia and through Asia in the temperate belt up to Japan. It occupies also most of southern Siberia. It is absent in Africa. In the area where it lives is widely diffused even if never numerous. It has a twin sister in Sardinia and Corsica, the Argynnis elisa, a butterfly unknown in other areas, which differs for the slightly smaller size, for the limited spotting on the upper face of the fore wing and the numerous and small silvery lunettes on the back of the rear wing. It lives in uncultivated grassy and sunny meadows in the plains as well as in the mountains punctuated by rocky outcrops where often it gets shelter even if it does not disdain partially woody areas. Wingspan of 50-60 mm. We underline that, in particular, the species distinguishes from the dark green fritillary for the fore face of the back wing characterized by a row of red post-discal spots with silvery centre. These spots are much more accentuated than those found in the niobe. The female is quite similar to the male, often slightly bigger and more heavily drawn with a noticeable dark shade on the basal area. Many subspecies of adippe have been described based on the presence or not of the silvery spots on the lower face of the rear wing. The form cleodoxa, rare in continental Europe, but more frequent in the warmest part of its range, has pale spots without silvery colouration, apart a reduced presence of the red spots n the post-discal belt. The antennae are well developed and robust, of yellowish brown colour, with darker flat and rounded vertex. It has a flying period rather reduced, going from June to August. It loves a lot to perch on the flowers of bramble and of marsh thistle even if it does not disdain other essences. 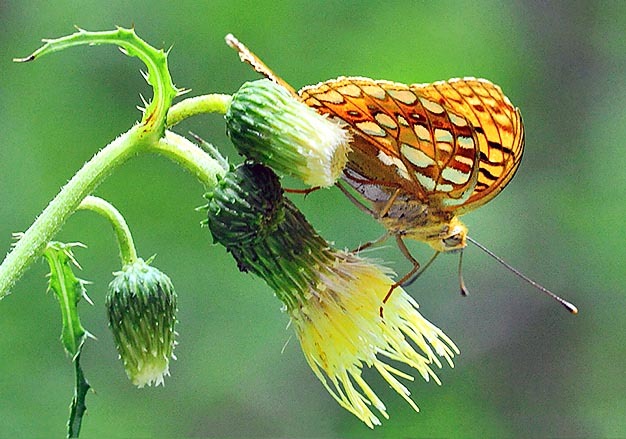 It has fast movements and powerful flight which it suddenly discontinues as soon as it sees a flower to its liking. Contrary to many other species of butterflies, it is a rather vagrant species and strays far from the hatching place. It is a monovoltine species. The female looks for sheltered locations where to lay the eggs often choosing sunny and well warmed slopes. It lays the eggs among the herbaceous vegetation growing close to small rocks where they find a more repaired shelter from the harsh winter. The hatching happens in spring from April and May and the caterpillars reach the full development after about four weeks. In this period they need a lot of warmth and of sunshine in order to reach the maximum development as soon as possible. The pupation takes place not far from the host plant, in a small cocoon hidden among the dried leaves collected at the roots of shrubs or grassy tufts. The host plants belong to the genus Viola. The caterpillar is brownish, crossed by some whitish striae and totally covered by spiny prominences of brick/orange colour. Papilio cydippe Linnaeus, 1767; Argynnis cleodoxa Ochsenheimer, 1816; Argynnis chlorodippe Herrich-Schäffer, 1851.